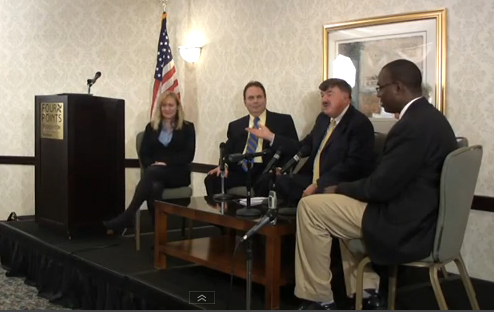 A panel of five reporters, moderated by Len Lazarick of MarylandReporter.com, analyzed the recent 90-day session of the Maryland General Assembly at a luncheon put on by Maryland Business for Responsive Government. The video below includes the first 10 minutes of the program, in which the reporters discuss issues to which they gave special attention. The panel included, from left, Allison Bourg of The Capital Newspaper, John Rydell of Fox 45 , Lazarick, Lou Davis of Maryland Public Television and P. Kenneth Burns, now of WYPR radio. The topics included John Leopold’s poetry, how the new campaign finance law impacts free-spending political slates, the military veterans employment bill and the racial dimension of the death penalty. The video was produced under difficult ballroom conditions by Fosie Weston of On the Hill Media.